Any trip is incomplete if you do not try that country's most adventurous food. Well if you're visiting Vietnam, then here is our list for you, arranged from easy to hard! Besides signature dishes such as pho, bun cha (grilled pork rice noodle), and banh xeo (Vietnamese pancake) Vietnamese cuisine also offers cultural delicacies that are probably a little (or very) strange to you, but nevertheless delicious. You may call it weird food, or strange food, unique, rare, challenging food, but whatever it is, the Vietnamese love it. And not just the Vietnamese, but most countries have a “Top 10 Weird Foods” list, whether it be China, India, Peru, or Ghana. What we’re trying to say is, you should never judge a meal without tasting it. 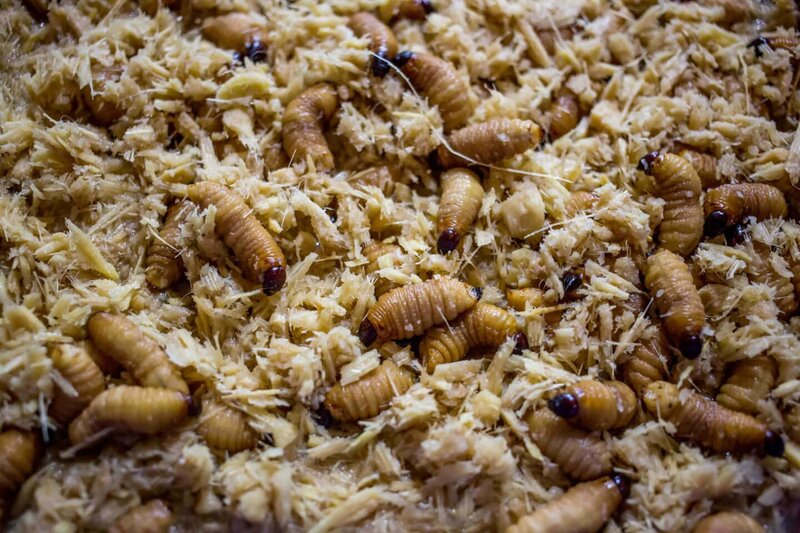 From bugs to rats to intestines and brains, this list covers the top ten weird foods you must try when you’re in Vietnam. It starts off easy, and you’ll get to the really adventurous options as the list progresses, so make sure to read through them all! There are two types of people in the world: those who love durian and those who hate durian. Vietnamese people usually joke that this fruit is a secret weapon to break friendships because of its smell and taste. Durian, dubbed “the king of fruits”, is a seasonal tropical fruit that grows from June to August in many Southeast Asian countries. Then why should you want to give this smelly fruit a try? 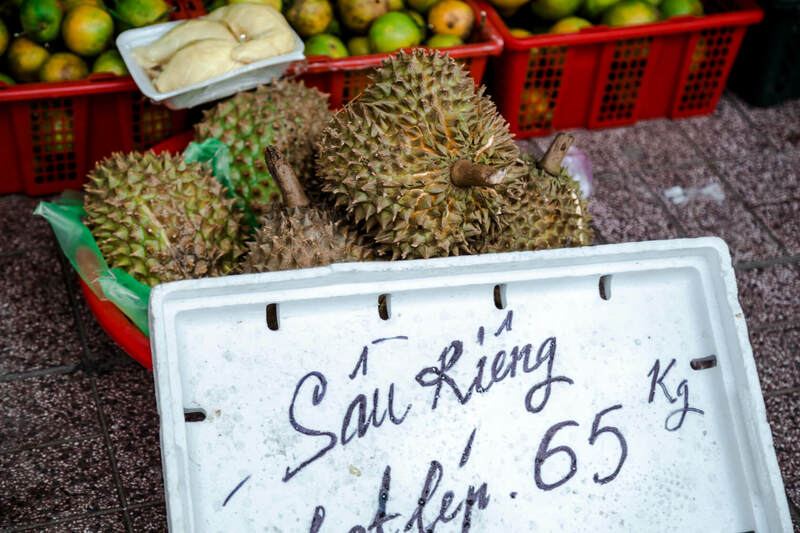 In fact, scientists have proved that durian is highly nutritious, and a moderate amount of this fruit can help an individual maintain healthy blood pressure, support one’s digestive system as well as improve cardiovascular health. However, people with diabetes should be careful when consuming durian since the fruit has high sugar content. If you want to try durian, there are a few dessert options you can choose besides eating the fresh flesh itself. Some dishes to try are durian pie (banh pia), fried durian pie (banh sau rieng chien), and durian sweet soup (che sau rieng). The taste of sau rieng is sweet and fatty but it can cause dizziness if you can’t stand the smell. Up for the challenge? Pro tip: Some people believe that they can balance the excess heat in their body created by the durian by drinking salted water from the husk. They were right about drinking salt water. But drinking from the durian’s hard shell is not necessary. Another stinky food on the list is fish sauce. You might not realize it but almost every dish you eat in Vietnam contains fish sauce (or nuoc mam). 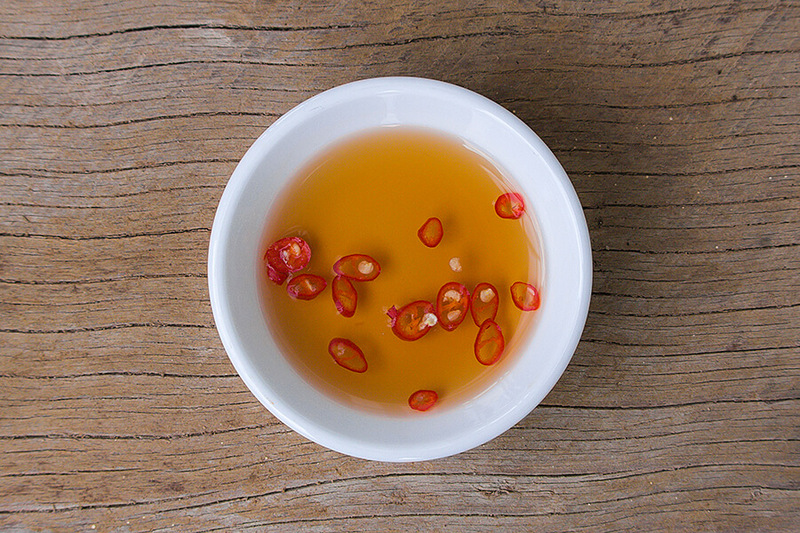 Nuoc mam is not just a dipping sauce but also an essential ingredient in many Vietnamese dishes. Fish sauce is made of salt, water, and most importantly, fermented anchovies. There are two types of fish sauce: one is salty and the other, sweet. The salty nuoc mam is used as a dipping sauce for plenty of dishes or for soups. It helps bring out the intense taste of the dishes. Sweet nuoc mam is a mixture of salty fish sauce, vinegar, and sugar. People also add ground garlic, chili, ginger, and a squirt of lemon to create different flavors of nuoc mam for different dishes. If you are still not sure about giving this sauce a shot then maybe Christine Ha, the final winner of Master Chef season three could convince you. Miss Ha impressed the world’s top chefs like Gordon Ramsay, Graham Elliot, and Joe Bastianich with her humble Vietnamese-inspired food using nuoc mam to enhance the flavors and win her title. Doesn’t it sound less crazy now? If you feel persuaded and want to taste nuoc mam, there is no shortage of places you can go. -The sweet fish sauce usually goes really well with banh xeo, banh khot, and bun cha. –Some Vietnamese do not like the original flavor of fish sauce. You can add a few drops of lemon to it to make the smell fade. If bun dau mam tom is not mentioned in a weird Vietnamese food list, then the list should be ignored. Mam tom plays a stable role in Northern Vietnam cuisine and bun dau mam tom is the most popular food there. This love spread to Saigon as well. People have a love/hate relationship with this dish. Those who are into bun dau mam tom will always call out its name when asked about what food to eat next. On the other hand, half of the world will just want to stay away from the stinky shrimp paste. For most people, the fermented shrimp paste smells like dirty feet. Despite its smell, the taste of mam tom goes perfectly well with other ingredients like vermicelli, fried tofu, boiled pork, and veggies. Pro tip: People usually add kumquat to the paste to make it smell better which creates a sweet and sour flavor. A few slices of chili will also add a spicy touch to the dish. So these are the mild dishes on the list of weird foods in Vietnam. Now comes the more adventurous dishes. Cow intestine soup (pha lau bo) is a dish many locals love. This dish is a combination of the culinary styles of the Vietnamese and the Chinese. Instead of throwing away the inner organs of the cow, Vietnamese people use them for more dishes. To make magic happen, the cook washes all of the organs many times, using salt and lemon to remove the bacteria. Ginger and wine also help to remove the pungent smell. Then, the organs are cooked in milk to make noodle soup. Finally, the cooks will chop the kidney, stomach, intestines, lungs, and heart to serve the hungry pha lau lovers. The smell stimulates your senses and makes you want to have more. The texture and taste of the soup go well with the sweet and sour dipping sauce, nuoc cham. The dipping sauce is a mixture of fish sauce, sugar, and kumquat juice. The ratio of kumquat juice and fish sauce is 2:1 which makes the smell of fish less stinky, and gives it a sour flavor. Based on the ingredients of the sauce, people refer to it in different ways: nuoc mam tac or nuoc cham tac. This street food is loved by the Vietnamese, especially young people. On rainy days, a bowl of cow intestine soup with instant noodles or banh mi (Vietnamese baguette) has the magic to brighten up one’s mood. Besides the soup, the intestine sauteed with butter and tamarind sauce (pha lau xao bo) is an evolved version of cow intestine you might also think about trying. Pro tip: Pha lau can be found in many restaurants but the best way to enjoy this dish is by grabbing a bowl at a street vendor. Pha lau Di Nui in District 4 is where a lot of Saigonese youth gather together to enjoy this dish. They serve two kinds of intestine as mentioned above, and the place takes care when preparing the food, so you don’t have to worry about health. The pha lau in this place is soft and chewy while the soup tastes sweet. Don’t miss out! Can you identify the body parts? Frog is a “less scary” food compared to many others that will follow on the list and it is not only just a beer snack but Vietnamese also have it as a meal. We like to eat frogs that are small with long legs. They can usually be spotted in the Mekong Delta all year round, but the high season is in spring or during the rainy season. 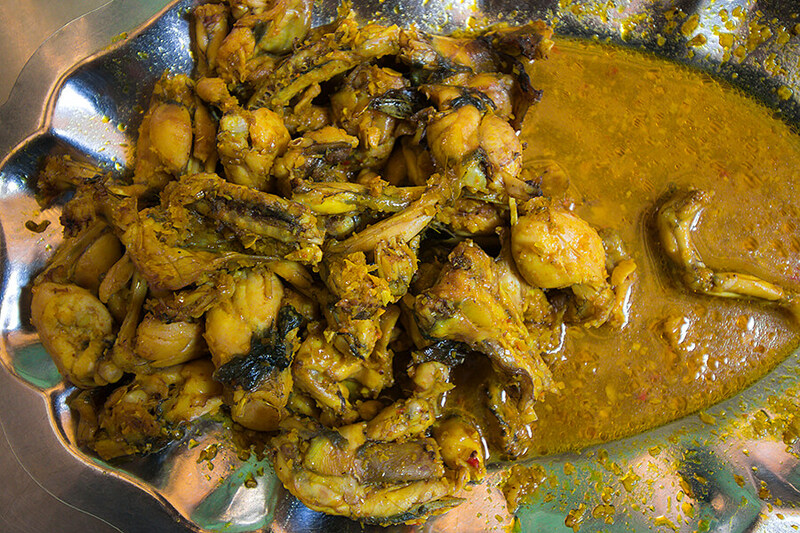 After skinning and gutting, the frog is then fried, steamed, or grilled and then served on the dining table. You can enjoy it with rice or just have BBQ frog with lemon, salt, and pepper. Other than boiled or grilled frog, you can choose to eat frog curry, frog porridge, or sauteed frog with lemongrass and chili. Even though it doesn’t look good, the flavor is delicious. Frog meat tastes like chicken and contains a lot of essential vitamins and vital minerals so it is seen as a healthy food. The biggest advantage of eating frog is that it helps malnourished children gain weight. Pro tip: The best part of the frog is the crunchy skin. Rat is another food that makes its home in the fields of the Vietnamese countryside, especially in the Mekong Delta. This is also yet another great example of the Vietnamese are innovative and resourceful eaters. Nevertheless, not every rat can be turned into food. Only the rat that eats the rice of the rice paddies is good for cooking. The farmer will skin it and then grill, steam, deep fry, or make curry with this little rodent. I won’t describe its taste in order to encourage you to go and try it yourself! Maybe eating rat sounds a bit odd but it is very tasty. The rat meat is soft yet chewy, many people claim that it tastes better than beef, pork, or chicken. If you need more motivation, check out this video of Sonny Side, the star of the Best Ever Food Review Show eating rat in the Mekong Delta. A few more dishes of rat meat you should consider trying are sauteed rat with lemongrass (chuot xao xa ot), roasted rat with salt (chuot rang muoi), and simmered rat with coconut juice (chuot om nuoc dua). Vietnam is not the only country that takes advantage of rat meat. Dishes made from rat are also popular in neighboring countries such as Thailand, Laos, Cambodia, and China, or farther countries like India and Ghana. The list is just about to get more adventurous! If you don’t want to stay anywhere near smelly food but still want to challenge yourself with adventurous tastes and textures, go for fried insects. In many Asian cultures, eating insects is a common thing. The types of edible insects vary from grasshoppers, bee larvae, and white crickets to scorpions. But why insects? Are we running out of food or is there any particular reason to eat these bugs? Lately, the United Nations has recommended people to consume insects instead of meat as it is a great source of protein, fat, and vitamin. In fact, it might sound weird but very healthy to ingest. Now if you feel like you want to have a go at eating crunchy and succulent fried insects, here are a few dishes for you to consider: cicada fried with lemon leaves, fried bee larva seasoned with dried onion, ginger, and slices of fresh lemon, sticky rice with ant eggs, and deep-fried scorpion. Because insects are low-fat and protein-rich food, if you’re on a diet- this is your answer! You might have had your fair share of raw food (like the fascinating raw salmon or prawn…sushi) in the past but the coconut worm takes the game to the next level. Do you dare to pick the live fat coconut worm swimming in a bowl of fish sauce and put it in your mouth? Coconut worm is a yellow larva with a brown head. It usually lives inside the coconut stem and eats coconut tubers. In the Mekong Delta, live coconut worm is a specialty dish. Coconut worm is most yummy when it is still alive. It will surely be a little scary at first glance because the worm will still be moving in between your chopsticks. But if you can get over your fear and eat it, you will love the flavor. If you are not a big fan of fish sauce, you can have the live coconut worm with cold beer. In case you don’t want live larva but are still curious about the taste then go for cooked worms. Some popular dishes you can find are grilled worm, butter fried worm, worm steamed with coconut juice, or coconut worm porridge. Worms can only be found on dead palms so people have to cut down the tree to catch them. 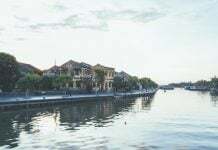 This explains why the sale of duong dua is prohibited in Vietnam. 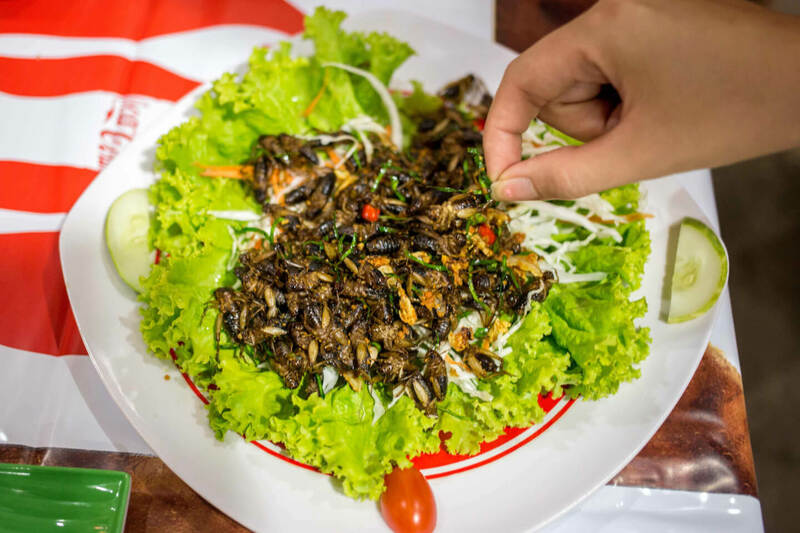 If you’re down to try insects, live insect larvas, and other dishes mentioned on this list, then this dish is just another tasty challenge for you: blood soup (tiet canh). 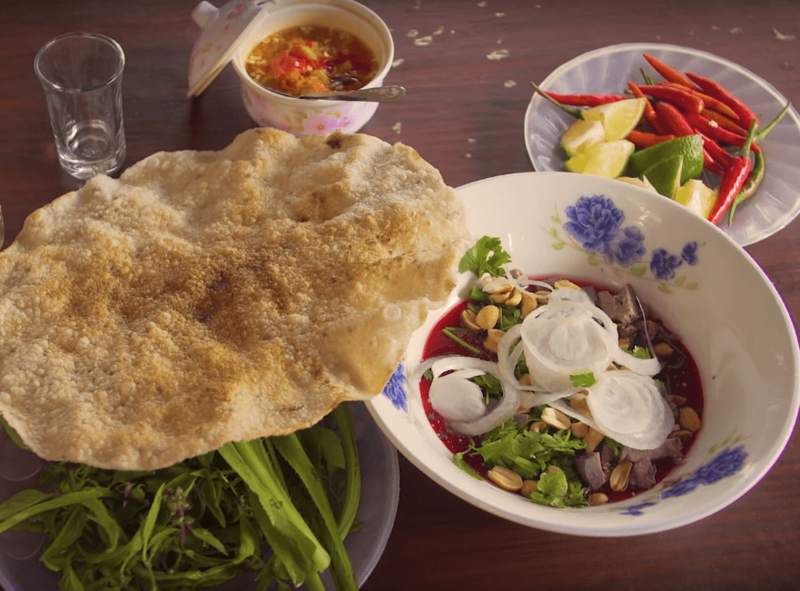 Blood soup is a dish from the North of Vietnam, and it has a special ingredient. Yes, that would be raw blood. Commonly, it is duck blood, but it can even be pig or goose blood. The raw blood is collected in a bowl and then mixed with fish sauce. The salty fish sauce prevents the blood from premature coagulation. Now once the blood is set, like a jelly cake, minced cooked meat and organs are added into the bowl with peanuts and herbs such as coriander, mint, and pepper, along with spicy chili. These ingredients will create a really beautiful layer on the top of the jelly-like blood, just like a pizza. People used to believe that this dish is a great protein-rich breakfast. However, with the situation nowadays when it comes to food safety, it is only reliable when you know the blood is from a healthy animal. Other than insects, balut is another weird snack or beer food that the Vietnamese enjoy. Hot vit lon is a developing duck embryo which is usually boiled or steamed and eaten from the shell with laksa leaves, salt, pepper, and lemon or kumquat. Northern people usually peel the egg, put it in a bowl and eat it while Southern people usually mix salt, pepper, and chilis with some lemon or kumquat juice first. Then they place the egg on the egg cup, tap the top of the egg, and make a small hole. Next, they drink the juice. Finally, they chop off the top and use a small spoon to eat the duck in the shell. The reason why balut freaks out the majority of Westerners is that when breaking the shell of a well-developed egg, diners will see the duck’s features clearly. You’ll probably see a face, beak, and maybe feet. Imagine chewing a whole soft baby duck with a full figure and even feathers! Fetal duck egg is a nutrient-dense food. It contains a lot of vitamins (A, B, C) and vital minerals (protein, lipid, calcium, and phosphorus). In Vietnamese traditional medicine, balut is thought to be good food for the brain and blood. You should notice that eating too much balut can increase the amount of cholesterol in your blood and cause an excess of vitamin A in your body. The ideal number is to eat two eggs per week. Balut is a popular beer food. You can find it in many vendor shops or mobile food carts in Vietnam. If you don’t dare to eat the whole egg, you can go with the yolk (yellow part) and the white hard part like many Vietnamese children do. Besides boiled and steamed balut, which tastes eggy and chewy, sizzling balut with tamarind sauce (hot vit lon xao me), and fried balut with butter are some good balut dishes that you should try. Fun fact: Superstitious people eat an odd number of hot vit lon every time they have bad luck because the word “lộn” means “reverse” in Vietnamese so they believe it can turn bad luck into good. Sound interesting? So there you have it. Those are the ten most popular strange foods Vietnamese usually eat if you ask for the real local experience. How many dishes on the list do you want to try? Or have you already eaten some adventurous foods in Vietnam? Is there anything we have missed on this list? Don’t forget to share your experiences with us in the comment box below. When in Vietnam, eat as the Vietnamese do! Be brave and have fun exploring Vietnamese cuisine! Enjoyed this article? Follow Christina’s Blog for more fun info on what to do, see, and eat while in Vietnam! Where is a good place to find rat, coconut worms and insects in Saigon? This place is going to be a little far from the city center though. 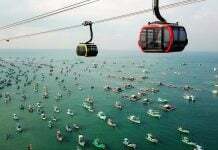 do you transport from moc bai to ho chi min? I’ve been working around moc bai, and have a plan to go to saigon, maybe you can help me inform? Hey Eka, there are many daily buses going from Moc Bai to Saigon. You can catch the bus number 70-3. It starts from Moc Bai and drop you off in the center of Saigon. The first bus of the day leaves the station at 8:30 AM and the last one leaves at 7:10 PM. 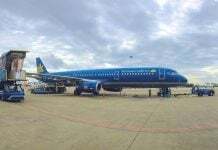 It costs around 35.000 VND for a one way trip from Moc Bai to Saigon.